For starters, the ceremony heralded the graduates of the county’s first-ever K-9 patrol and narcotics training course. Previously, K-9 teams traveled to Ohio to receive certification. Additionally, the ceremony included three SEPTA K-9 teams, marking the start of a welcome partnership that’s likely to continue. “This is a very special day for everyone here,” said Chester County Sheriff Carolyn “Bunny” Welsh during the ceremony, which was held at the Chester County Justice Center. Welsh noted that the teams had worked diligently since September to complete the rigorous course. The graduates included Chester County Deputy Sheriff Mike Sarro and his partner, Dexter; Chester County Deputy Sheriff Mike Carlson and his partner, Luke; SEPTA Officer Jason Walters and his partner, Jase; SEPTA Officer Richard Donaldson and his partner, Quest; and SEPTA Officer Derrick Gordon and his partner, Lars. Welsh said the initiative was made possible through the efforts of Chester County Deputy Sheriff Paul Bryant, a Level III trainer for the U.S. Police Canine Association; Chester County Lt. Harry McKinney, a master trainer for the National Association of Professional Canine Handlers; and Chester County Deputy Sheriff Brian Bolt, a training assistant. Bryant, who joined the Chester County Sheriff’s Office after spending nearly three decades with the Philadelphia Police Department as a K-9 instructor, said the impetus for the program started after he began receiving calls from other agencies that wanted to know if Bryant was still available for training programs – inquiries that he forwarded to McKinney. Recognizing the economic sense of using in-house resources for the new K-9 teams, McKinney said a county training program would also help to strengthen the skills of the existing teams, and Welsh readily agreed. Bryant explained that the program gets altered “to meet the needs of the participants.” For example, part of the SEPTA training took place in transit. The county K-9 teams did some of their work at area parks, such as Wolf Hollow, he said. 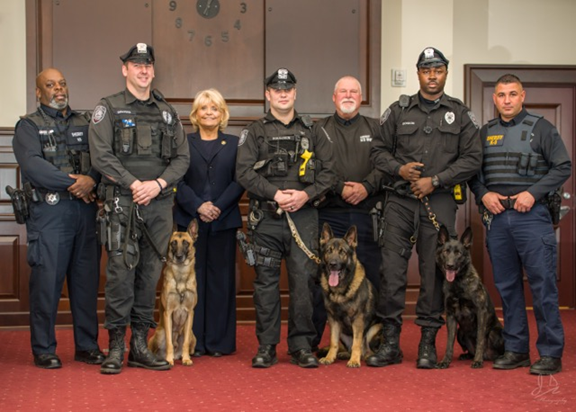 Bryant credited Welsh with not only promoting an atmosphere that encourages K-9 teams in her office, but also with providing the law-enforcement community with a valuable training option. “The more opportunities that these officers have to receive certification, the better it is for them and for the public they serve,” Bryant said. Welsh said that the office’s 10 dogs respond to several calls each week. The most frequent involve searches of vehicles or buildings by teams trained to detect narcotics or explosives. Equally in demand is Melody, the office’s comfort dog, who often calms children who have to testify at trial or eases stress for all in custody disputes. McKinney said the next class, which will include teams from Ridley Township, would be held in March. Caption: Chester County Deputy Sheriff Paul Bryant (from left); Chester County Sheriff Carolyn “Bunny” Welsh, Chester County Lt. Harry McKinney, Chester County Deputy Sheriff Brian Bolt assemble for the graduation ceremony of Class 001 Patrol and Narcotics. SEPTA Officer Jason Walters and his partner, Jase; SEPTA Officer Richard Donaldson and his partner, Quest; and SEPTA Officer Derrick Gordon and his partner, Lars.